Ok so I know that this title seems like a mouthful, but I honestly didn’t know what to call this glorious creation! I made this for a dinner get-together last night, and everyone loved it!! Well…they loved how it tasted…not so much the calories. I have several desserts that are low-cal or low-fat, but not this one! This dessert just revels in all its unhealthy goeey, sugary glory. The reason this dessert has such an involved name is that there are so many names it really could go by! I’ll describe the taste to you, and then maybe you can give me your suggestions for a simpler name. The dough for this is made primarily from melted Hershey’s Cookies N Cream Bars (hence the Cookies N Cream part). However, once it’s baked you really can’t taste much of the white chocolatey-ness of the candy bars. Instead it tastes more like cookie dough. Yup, after being baked, this whole dessert tastes similar (and has similar texture) to cookie dough. 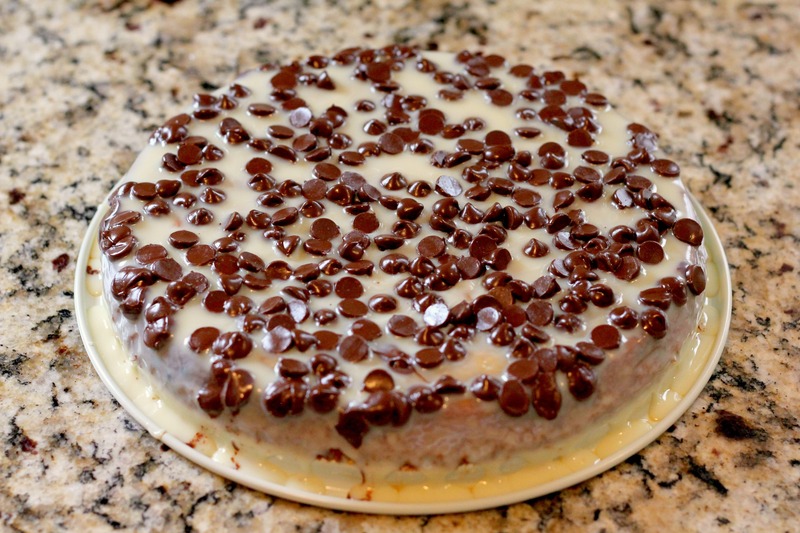 Then the glaze on top is just all sugary sweet goodness with condensed milk and chocolate chips. I called it a brownie because it’s dense and thick like a brownie. And I called it a pie because it’s round and you slice it like a pie, not like a square brownie. One thing is for sure, this is one RICH dessert. You definitely don’t want to get caught eating this bad boy without a tall glass of milk. Last night, at our get-together, our friends’ 4-year old said, “mmm! this has such a sweet texture!” and their 3-year old said, “this is making me thirsty!” It was definitely a big hit with the kids (who were not so concerned about the calories). 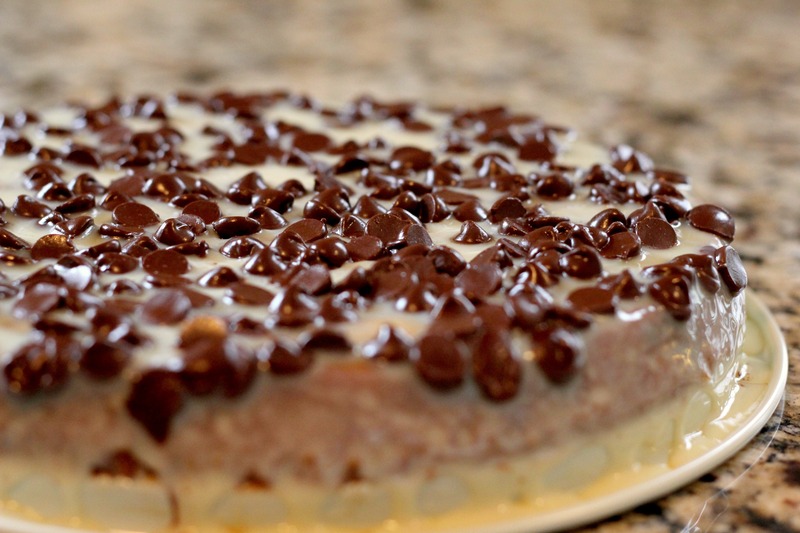 Honestly, this is one of my favorite desserts because it’s actually really easy to make, and it turns out like something you spent hours preparing. Melt candy bars, sugar and butter in a large sauce pan over medium-low heat. Pour into greased 9 inch springform pan. Bake at 350° for 20 minutes. Remove from oven. Immediately pour 7oz. sweetened condensed milk over top of brownies. 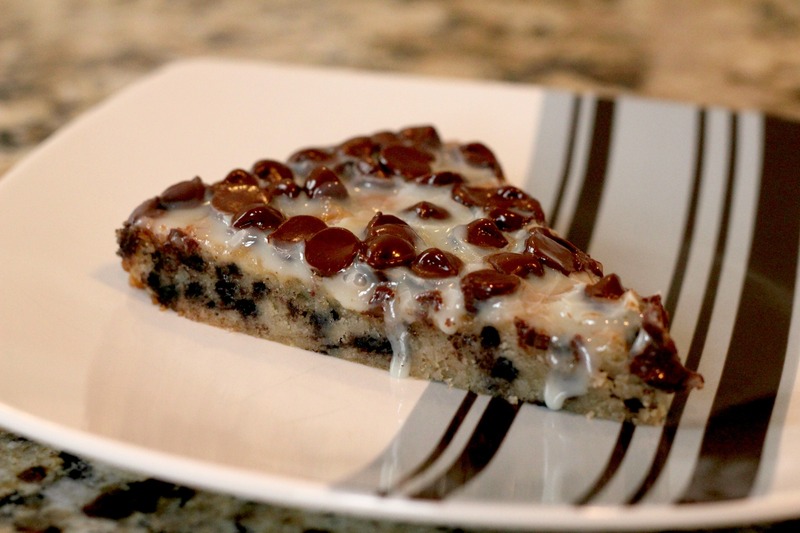 Layer with chocolate chips. Let cool. Thank you Allison! This is DEFINITELY a crowd pleaser I hope you and your kids enjoy it! Looks awesome! Gotta try this! About 10, depending on how you slice it. It’s so rich, you might want to cut them into small pieces and get more servings.